Here’s the basic idea behind adoptive T cell therapy: Patients whose cancers don’t respond to conventional treatments can have some of their own immune cells known as T cells plucked, genetically re-engineered to better target their cancer cells, and reinserted. In recent years these treatments have achieved dramatic early clinical successes, and there’s a lot of excitement about them. 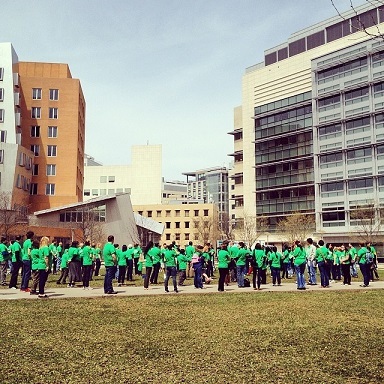 This excitement made adoptive T cell therapy a prime candidate for the third annual Biology Flash Mob at the Koch Institute for Integrative Cancer Research at MIT, which drew about 180 volunteers on Friday morning. We volunteers were a diverse group—by a show of hands, one third of us worked at Koch and one third had never heard of the institute—and several of us were only two years old. Our Koch hosts divided us into groups of healthy cells (green shirts), cancer cells (red shirts), T cells (blue shirts) and scientists (purple shirts and white lab coats). After a quick rehearsal, the healthy cells marched out and arranged themselves in the center of the quad behind the Koch. They cheered as the T cells filed through them and kept them in line. When one healthy cell popped a red umbrella to show that it had turned cancerous, the T cells took their pom-poms and pummeled it into submission. But then several healthy cells not only broke bad but hid themselves from the T cells (as real cancer cells do all too often), the T cells wandered around in helpless zombie fashion and dozens of other cancer cells poured in. Virtue triumphed, however, after the T cells hurried out to be genetically re-engineered (fortified for battle with big foam hands). They charged back into the mass of cancer cells, and swiftly demolished all the bad guys. The flash mob ended with loud cheers, even from the cancer cells. And we hoped that the cheers will keep echoing in the real world of cancer medicine. A video of the flash mob will be posted in coming weeks. Meanwhile, you can view the 2012 Koch flash mob, which acted out a targeted cancer therapy technique based on nanoparticles, here. Photo courtesy Koch Institute for Integrative Research on Cancer at MIT. Saturday’s Science Carnival, by far the Cambridge Science Festival’s largest event, was a great success. The Festival now fills Cambridge high school’s huge main gym plus a basketball gym plus the tennis courts just outside with a remarkable range of mostly interactive science exhibits and completely enthusiastic proponents. Thousands of families came, and not just for the wildly popular robot zoo. I enjoyed volunteering, mostly helping exhibitors carry in their wares—everything from human-size chess pieces to kites to amazingly complicated robot prototypes. I ended up with a stint helping Terry Murray (the Inventor Mentor) launch rockets on the high school’s sunny front lawn. Young kids and their parents got a big kick out of launching water-bottle rockets with stuffed animals on top. So did I.